Hello, I’m so glad you’re here. And since you’re here, you’re either open to fantastically wild ideas, or you’re a traditionalist who still can’t believe we have interleague play, wild-card teams, and one-game playoffs. You’re either more than happy to discuss why the DH should be universally adopted, or you’re here to tell me why the NL brand of baseball has “more strategy” because of all the situations regarding when to go to your bullpen instead of letting this happen. Let me begin by saying that I too used to be, or maybe still am, a baseball traditionalist. I have great respect for the history of the game, but I’d also like to embrace the things that make it great and that can make it a better product for the future. This isn’t about mindlessly making changes to the status quo; rather, it’s choosing the best of what baseball has to offer and featuring it as much as possible. With that in mind as the backdrop, here are the four radical changes I’d make to Major League Baseball to deliver on what I already see as being the strengths of the sport. At the same time, I propose these changes will minimize the things that are bad for the sport. And yes, the Sawchik Playoff series will be part of the solution in the wild-card round. Yes. They should. I hear your argument against it. Strategy, right? Or tradition that the pitcher should hit? It’s a quaint notion. I respect your opinion, but thoughtfully disagree. Bullpen strategy in baseball is evolving quickly to a point where this decision of “when to pull your starter” very rarely coincides with the decision of whether or not you want him to hit this inning. Reliever specialization and matchup-based decisions are more often than not the tipping point rather than a decision around whether or not to let your starting pitcher hit one more time. There are more frequent decisions around how long can I let a particular reliever pitch, should I use this reliever for more than three outs, or can this reliever pitch for a third consecutive day? As for the tradition argument, I’d argue that most pitchers stopped trying to be professional hitters decades ago and it’s time we recognize this for what it is: a dying notion. This is about having the best product on the field for fans to watch. Pitchers in 2017 collectively hit .125/.163/.164. This is bad for baseball. Try this as a thought exercise. You’re already thinking about him — Madison Bumgarner. He’s a pitcher who can hit and hit home runs. Or if you prefer, Adam Wainwright. Take your pick! In the hypothetical world where the DH exists in the National League I’d argue you could let either of them DH — if you really wanted to see them hit. Would the Giants or Cardinals ever do this? The answer is no. They wouldn’t want to risk injury to a player whose primary role on the team is to take the ball every five days and throw it. So why are we still making them hit? Now that we’ve universally adopted the DH, we don’t really need the distinction between the National and American League. We already have interleague play every day of the season. There are no NL and AL umpires. There isn’t an AL-only players union. We already associate all-time records with all of MLB and not league-only specific records. This gives us the freedom of making sensible decisions around radical re-alignment. Traditionalists will argue that the current playoffs no longer guarantee that one of the best teams will win the World Series. They’ll argue that the wild card has diminished the meaningfulness of winning your division. They’ll argue that interleague play is silly. I agree with them, but let’s embrace the fact that these things are not going away. What can we do to build upon these ideas and make them better? First of all, interleague play and its “natural rivals” approach is very flawed from a competitive-balance perspective. I don’t want to eliminate it; rather, I want to embrace it and make it part of the landscape. The best part about baseball are the rivalries and traveling to ballparks in (and outside) of your area to watch teams play. Mets/Yankees? Royals/Cardinals? Yes please! But we can do better through radical geographical re-alignment to enhance these rivalries. At the same time, through natural geographical selection we pit market-size rivals against each other as well. This setup allows us to retain the geographic rivalries. The seven-team divisions can play each division rival 14 times. The eight-team divisions can play each division rival 13 times. This allows for a single series against every other team in baseball. If you were worried that the Cubs/Cardinals series was going away, it’s not. They still get to play every year. This is a more balanced approach to scheduling and allows each team to see the game’s star players. Why should Twins fans only get a chance to see Giancarlo Stanton mash 500ft monster blasts once every blue moon? Does a Pirates fan even know who Mike Trout is? Why are we hiding the stars and confining them to their leagues and divisions? Let the fans see and appreciate all the star players. This format will allow for four division winners, who will all be granted a bye in the first round of the playoffs. This will make for meaningful pennant races and bring back the excitement of winning your division. Winning a division against four other teams and playing those four teams nearly 80 times isn’t exciting. As a Brewers fan, by the time we get into August and September it’s all I can do to watch another series against the Reds or the Cardinals. At the same time, because you’ll only play four series against your divisional foes, it will make those four series just a little more meaningful – especially for the teams battling atop the divisions. Travis Sawchik opined that MLB should adopt the KBO playoff format for the wild-card round. This is something I can support. While we’re at it, let’s face it, the best team is probably not going to win the World Series anymore. Once we stopped playing for a league pennant and had one World Series to crown the best American baseball team, we introduced the idea of the best team not winning the title. It’s a fact that the regular season no longer has much of an impact on the playoffs. We’ve established this. The playoffs are simply a tournament for the “better teams in baseball to determine a league champion.” If we wanted the best team to be the champion we’d quit after the regular season and see who had the most wins. It’s for this reason I’ve been suggesting that we as baseball fans #embracethetournament. I’m not as radical as you think. I’m not telling MLB to change the rules to let the 12th-best team into the tournament — they already do that (2012 Cardinals). I’m not telling MLB to change the rules to let a wild-card team win the title — they already have (2014 Giants). I’m not telling MLB to change the rules to allow an 85 or 86-win team into the playoffs — they already have (2017 Twins, 2015 Angels). What I am suggesting is that the expanded playoff pool would increase the popularity of the tournament, and allow MLB to showcase their star players more. The wild-card round could certainly feature the KBO playoff format where the 4-8 seeds host the 9-12 seeds for a best-of-two home playoff series whereby the home team needs to win only one game and the away team needs to win both to advance. We won’t need any Game 163s because teams will have already all played each other three times during the regular season and we can break ties head-to-head. I’d prefer seven-game series for the Divisional round, Final Four and World Series, but could live with five-game series for the Divisional and Final Four rounds because, at the end of the day, it doesn’t really make it any more or less random. Major League Baseball has a solid product, but it could be better. By allowing more playoff teams, even if for just one or two games, it creates a chance to see more of the league’s stars in the national spotlight. This is also achieved by letting every team in baseball play every other team in baseball each year (though I concede I don’t know the effects on scheduling). By re-aligning the divisions, MLB can emphasize the natural geographic rivalries without a hokey home-and-home interleague series, while these larger divisions bring back some meaningfulness to the term “pennant winner” by including a bye. Finally, the removal of the American and National Leagues allows for re-seeding of all the playoff teams based on record in each round (if #12 advances, they’d play #1 in the divisional series), and allows both leagues to play under a common DH rule. Don’t misunderstand my grasp on reality here; I understand this would likely never happen — but why not? Can you come up with a reason other than tradition? Is your name Christian Yelich? If not, please stop hitting ground balls. Right now. Please. Thank you. Christian Yelich is the only MLB player to log 2400 PAs over the course of 2014-2017, hit 55% or more ground balls and log a wOBA of .340 or higher in a single-season. And he’s done it in all four seasons. How does he do it? He combines a league-average line-drive rate (22%) with a .270 batting average on ground balls and a 10%+ walk rate. Sure, Jean Segura (3yr+ GB 55.9%) did it last year, but he dropped his GB rate to 53% and had a HR/FB excursion up in the 13%+ range that year. You might point out that during the same year, Jonathan Villar managed a .356 wOBA, but he needed an even-better-than-Yelich .316 average on ground balls with a 20% HR/FB ratio and an 11%+ walk rate. We’re talking about the definition of outlier seasons. After a quick back-and-forth with another FanGraphs reader/commenter, John Autin, in the recently published Justin Turner piece by Travis Sawchik I started wondering what sort of wOBA does each type of player carry based on the percentage of ground balls that player hits on average. But for starters, I had to understand how many players carried ground-ball rates in what ranges. To provide a little more context, let’s view these player seasons on a 100% graph. Players who have averaged greater than 40% ground-ball rates have a 4-in-10 or better chance of producing a below-average season by wOBA standards (.310-.319 bin and lower). The “Great” (.370+) seasons lodged in the 50% bin are from Eric Hosmer (2017), DJ LeMahieu (2016) and Ryan Braun (2016). Braun needed an outlier HR/FB (~29%) season, LeMahieu is one of the ten deadliest line-drive hitters in all of baseball, and Eric Hosmer, well, he’s straddling the line 5/6th of the way through the season. There just aren’t that many great hitters carrying a GB rate between 50-55%. You’re going to either need to hit a TON of line drives to make up for all those ground balls, or pound three out of ten FBs for a HR. Otherwise you’re looking at a very average offensive season a quarter of the time, and well below average another 50% of the time. What I’ve learned is that 30-40% GBs is the sweet spot, and only a quarter of MLB player seasons from 2014 have been recorded by players in this bin. Freddie Freeman, the king of line drives, has lived in the 30-35% GB range over this time period. He’s joined by players like Lucas Duda (putting up three above-average seasons), Kris Bryant, Matt Carpenter and Brandon Belt. Interestingly enough, Ian Kinsler might want to rethink his approach. Along with a high infield fly rate, he’s just not doing enough damage with the HR to put up high wOBAs. The exception being his 2016 and 2011 seasons. Being that he’s an above-average line-drive hitter, he could benefit from shifting his focus a little more that way as he ages through his last few seasons. Or I suppose he could benefit from a more hitter-friendly home park as he enters free agency this year. Now that we have the table set, I’d like to share a short list of players that are putting up terrific wOBAs, but could benefit from putting even more balls in the air. Of course there’s Christian Yelich, but let’s let him do what he’s doing. And while we’re at it, we won’t recommend any changes for Joey Votto. One thing I’ve noticed, and this isn’t a new revelation to me, is that Cuban players like Puig, Grandal, and Abreu all hit a very high number of ground balls, even while enjoying quite a bit of success. But if they ever decide to make the anti-ground-ball leap, they may find an MVP trophy or two. Ditto for George Springer. Let’s get him ripping air balls and see how high he can fly. Looking team by team, at the approaches employed by their players who gathered at least 400 PAs minimum in any given year, and also have accumulated 1000 PAs over the last four years, we can pick out some trends as well. I was a little surprised to see the Mets at the top of the list, but the A’s, Tigers, Reds and Blue Jays didn’t surprise me as “put it in the air” types of teams. You’ve got some of the poster children for the air-ball revolution on those teams such as: Donaldson, J.D. Martinez, Jose Bautista, and Yonder Alonso. Those teams also feature some of the game’s deadliest line-drive hitters in: Nicholas Castellanos, Joey Votto, Miguel Cabrera, and Daniel Murphy (from his Mets years). On the flip side, we see the Marlins, led by aforementioned ground-ball expert Christian Yelich, pound-it-into-the-ground Dee Gordon, and Ichiro Suzuki, as well as a team-wide approach by Ozuna, Realmuto, Hechavarria, and Martin Prado to hit ground balls and line drives. Prado is the only one other than Yelich to do it well. The White Sox were led by Adam Eaton (54% GB), Avisail Garcia (52%), Alexei Ramirez (49%), Yolmer Sanchez (48%), Melky Cabrera (47%), and Jose Abreu (46%). Tim Anderson is the latest, though he doesn’t factor into the analysis yet, to pound out 52% ground balls like it’s his job and turn in awful wOBA seasons (.315 and .274 in progress). Where Are Anthony Rizzo’s Missing Hits? One of those two things is correct. Rizzo has faced a shift in 85.7% of his plate appearances this year, which isn’t different from the 85.5% he faced last season. Rizzo is, however, hitting only .247 on balls in play when facing the shift (.214 when not shifted) this year. This is a 54-point swing in BABIP from a year ago (.301 while shifted; .359 when not shifted). This amounts to 13 missing hits thus far this year against the shift (and six more when not shifted). For the purposes of this article I want to focus on the missing hits against the shift. What we have here is the symptom of something that’s going on when Rizzo is hitting this year that wasn’t happening as much last year, so I started sniffing around for other major changes in the Rizzo data. One thing that popped into my head was that the Cubs offense, especically the top of the order, has been getting on base much less this year than last year. That led me to thinking about what the defense looks like when there are runners on base versus when the bases are empty. 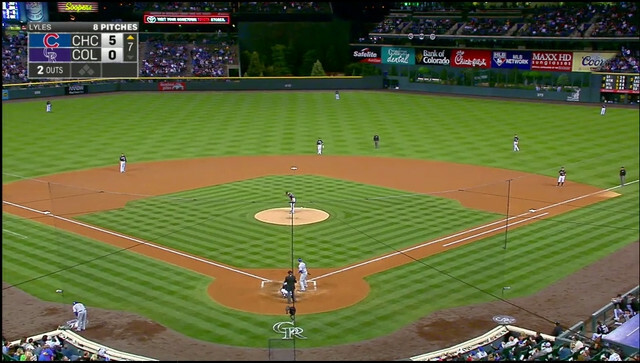 With only a runner on first base, the shift is the same, but with the obvious addition of the 1B holding the runner on. In 2016 Rizzo batted with runners on base in ~55% of his plate appearances and ~32% of the time with runners in scoring position. In 2017 those numbers have dropped to ~45% and ~24%. While I don’t have Rizzo-specific defensive placements for all his batted balls in play, I did compare his spray charts from last year and this year and noticed two very empty spots. The first spot is just behind the second-base bag, where the SS typically lines up in the over-shift against Rizzo. In 102 games this year, Rizzo has yet to collect a hit to this part of the field, while he had six hits within this area of the field last year and a few more just behind it to the opposite-field side. Using the FG splits tool we can see Rizzo has an .054 AVG in this area of the field this year vs. .333 from a year ago. The second empty spot is where you’d find line drives to the opposite field falling in before the left fielder. This led me to look into Rizzo’s batted-ball distribution to the pull side and opposite-field side for both ground balls and line drives. As you’ll see, Rizzo is going to the opposite field ~5% less on his ground balls, and non-oppo GBs turn into outs more frequently for Rizzo due to the shift. Rizzo is hitting .140 this year on ground balls to the left or up the middle, against a .345 mark from a year ago. This accounts for eight of his 13 missing hits. Another three hits are accounted for from luck against the shift on the pull side. The remaining two missing hits are from a slight change in batted-ball distribution on line drives to the opposite field. At the end of the day, I don’t think anything has changed with Rizzo outside normal variance in various batted-ball outcomes. The HBL is what many around here would call a “home league”, though I generally take that comment to mean the level of skill is lower than that of an expert level league, which in this case would do a disservice to describe the talented owners we have. Over the course of 18+ years this group has been together, we’ve honed something I now refer to as “Hampshire-style dynasty”. The key components to this style of fantasy baseball are: 25 man roster (1C, 3OF, DH, 9P, 7 Bench), $217 salary cap (25-man only), 10 man minor league roster and an annual “prospect draft” each year during the All-Star break. While many of you fantasy players are getting twitchy, accidentally clicking on your live scoring 6-10 times a day for the four day break, we’re enjoying a glorious, leisurely-paced live draft for our future man-crushes. Hampshire-style dynasty actually shares a few similarities with the Ottoneu-style keeper leagues, but the minor league portion of the roster is set to mimic real-life baseball. Minor league player salaries, upon promotion, are set based on the round they are selected. $4 for a first-rounder, $3 for a second, $2 for a third and $1 for a fourth. This ensures that you’ll be able to keep most players a minimum of 3 years before their salaries become a decision point, and for super-star players it’s common to see them kept for 6 to 9 years before being released back into the auction. The feel is something very similar to the arbitration salary escalation process. I share the background because I feel this feature is a fantastic one for those of you playing or creating dynasty leagues. The reason I wrote the article, though, is because I’m hoping to share the names of some further-off prospects to drive discussion. Because we roster 120 minor league players, we’re pretty well clear of the Baseball America Top 100 list, but both The Dynasty Guru’s Top 300 Prospects and the FG Consensus prospect rankings list are a useful base from which to begin monitoring prospect names. Both midseason prospect updates from BA and BP come out the week before our draft, and the new MLB draft class along with the J2 signings make for a really interesting first two weeks of July for us prospect hounds. Though I didn’t myself have a first round selection, I had Vlad Jr. as the number one player available. There are some players like Hoskins or Mejia who are closer to having a fantasy impact, but we’re generally drafting for ceiling here. Among the top arms available Mitch Keller has been my favorite for going on a year now. Both Guerrero Jr and Keller were on my list as possible fourth round selections last year, but I didn’t pull the trigger (Delvin Perez, SS, STL was my sole 4th round selection in 2016 because I’m a sucker for shortstop prospects). The Competitive Finish Round, which are picks awarded to those teams who finish in 4th through 6th place (just outside “the money”) kicked off what forever shall be known as the “holy cow the Braves have a lot of starting pitching prospects” draft. Round 2 featured a couple players I had pegged as first round talents on my board with Calhoun and Fisher. It didn’t hurt that their proximity to impact is < 1 year. I’m also biased against selecting many pitchers, especially prior to AA. The probability of them washing out, having arm/shoulder injuries, or taking the [insert pitcher name who flew through the minors, was called up, didn’t fare well for three years, but you owned him in parts of all three seasons only to see a league-mate hit the lotto after you dropped him for the fifth time name here] and having to live with that shame/guilt. Juan Soto was an interesting case. I’d honestly not heard his name before the BP midseason list came out and they ranked him #12. Once I started hearing things like “Victor Robles” I took notice and decided he was likely worth the gamble. My other picks in this round included Derek Fisher who I concluded was a safer high-ish ceiling guy with both speed and power (and currently nowhere to play in Houston, nor a decent lineup slot if he did), and Ryan Mountcastle who by all scout accounts won’t actually stick at SS but I’m hoping for a Brad Miller type. Mountcastle can’t take a walk, but we use AVG and Total Bases, so you can guess how many [poops] I could give so long as he can make it to the Show. Maybe he can learn from Adam Jones . . . or really any Orioles player, they really don’t seem to value OBP in that organization, do they? I was happy to see so many pitchers and catchers go, because my draft strategy basically has me ignoring them. I kicked off Round 3 with a player I decided I couldn’t wait on, even though I really wanted to get him in the fourth round so that his starting salary could be $1 someday down the road. I love Jhailyn Ortiz. A lot. Probably too much. You may or may not remember him from the Vladimir Guerrero J2 class. Well I did, and I just started seeing some hype articles on the kid this week. I got scared and jumped to grab him. This is the type of player, the “fast movers”, that we generally miss in our draft (myself included) and end up being #1 of 1 the following year. His power potential is unmatched and I’m glad to own his ceiling. My leaguemates all seemed generally bummed when Florial went off the board. I hadn’t read much on him but when there’s that much chatter when a single player goes off the board that’s generally a good sign for the owner who took him. The other player of note in this round is Austin Beck, who was dubbed “future hall-of-famer” by his team. This is the type of crazy prognostication smack-talk that becomes lore. I chose another player in this round, Taylor Trammel from the Reds. He’s your typical toolsy prep kid with speed and power. We all draft these guys every year. Sometimes they’re Monte Harrison and sometimes they’re Andrew McCutchen. The fourth round is where things really get fun. We’re really past all the highest ranked talent on the industry lists and now you’re just using your intuition to try and snag the guys who will become the 2018 1st round picks — a year early. I was lucky enough to have traded for a few extra fourth round picks and had 3 picks in a row near the back of the round. One player, I was sitting on all draft was Yankees 55FV SP James Kaprielian. He’s had Tommy John surgery this year, but with any luck I was able to snag a 1st round talent at a 4th round price. Having elite $1 pitchers to call up and hitch your wagons to for 4-9 years is every owner’s dream in this league. I’m just hoping he can be another TJ success story. I believe that if he doesn’t get hurt he’s right up there with Keller and Buehler in the fist round this year. My other two picks aren’t the most conventional draft choices, but sometimes you just have to go with your gut. Truth be told, Colton Welker was snagged infront of me, so I had to scramble for my last guy, who ended up being Cole Tucker. Tucker is ranked as the #5 Pirates prospect on MLB Pipeline and #7 here at FG by Longenhagen. I skipped rival Pirates SS prospect, Kevin Newman (#4 MLB, #5 FG) because I love the steals that Tucker has piled up in his time in the minors. I can see he doesn’t have 60 or 70 grade speed, but when you’re gambling on ceiling you have to throw up a few hail mary shots. I was able to watch some video on Tucker, and the scouting reports told me the same thing my eyes told me, which is that he’s awfully “slappy” for a 6’3 180lb former first round pick. Also, in the video I found, his hands are all over the place from the left side of the plate (he’s a switch hitter). I’m scared and excited all at once. The last pick I made was Yordan Alvarez. I was so caught up hoping no one noticed him or was writing about him to notice that he made the Future’s Game roster. Much like Jhailyn Ortiz, Alvarez is a former J2 signee as well and also has big time power. He was just recently promoted to A+ after destroying baseballs in A to the tune of a .297 ISO. I like the sound of that. I’ve had a great time writing up our league’s draft and I hope it’s given some of you dynasty league owners some more names to talk about. I’d love to see comments about who you think got great value in this draft, as well as anyone that wasn’t taken that you might have drafted. I can tell you that the top players left from the BA Midseason list after we were done drafting were: Luis Urias, Anthony Alford, and pitchers Brandon Woodruff, Alex Faedo, Ian Anderson, Anthony Banda, Erick Fedde, Justus Sheffield, Tyler Mahle, Matt Manning, Beau Burrows, and Nick Niedert. I considered some of these arms with my fourth round picks, but as I said, I prefer to see most of them pitch at AA and spend a higher pick on them if I really like them. No, you shouldn’t. Well, that was easy. I’ll be moving on to my “Why Haven’t You Bought Jeff Samardzija Yet?” article now. OK, so it’s not quite that simple and I suppose you want some things like facts, charts, numbers, etc, etc. You FanGraphs readers are all the same. Zack Cozart has been a bit of a fantasy darling early this year. Writers have pointed out his 13%+ walk rate to begin the year. His improved .230+ ISO. His .340+ batting average (I hope this is still valid by the time we go live, because it probably won’t be). Because you’re FanGraphs readers, I also know you’ve already looked at his .400 BABIP and processed the fact that he’ll likely regress, but how far? To what level? Will he be 12-team mixed relevant? 10-team? I’d like to take a shot at answering those questions. First of all, it’s not all bad news with Cozart. As Travis Sawchik would say, Cozart has joined the merry band of fly-ball revolutionaries, as evidenced by his increased fly-ball rate from 2013 to 2016, and he was on my list of possible value picks coming into auction season. His overall value in home-run leagues is capped by his HR/FB%, but I play in quite a few TB leagues so I wanted to keep an eye on him. I have a tool I like I built in Excel years ago to monitor BABIP-inflated statistics, and to regress the triple slash lines based on expected normalish-BABIP for ROS. While Cozart is currently sporting a triple slash line of .348/.428/.585, his .394 BABIP says that he should have approximately 10-13 fewer hits than he’s accumulated this far. It’s ~10 hits if you assume a league-average BABIP and ~13 hits if you assume his career .281 BABIP. What this means for you is that Cozart’s talent level right now is only supporting a .251/.331/.528 triple slash, or .274/.354/.541 if you believe he’ll overachieve his career BABIP. You may be thinking, okay, that’s great, sign me up, but there’s just one more outlier caveat on Cozart’s amazing start to this season. Did you spot it? He has four triples already! Unless you’re an extremely speedy player, and Cozart is not, triples basically come down to batted-ball or fielding luck. Hit it in just the right spot, or have a fielder take a bad run at a ball, and voila, you’ve got a triple (when you’re not fast). If we were forecasting Cozart’s triples for the rest of the season, based on his lifetime triples output, he might accumulate three more triples over the course of the final ~125 games, and we should probably have expected him to have only one or two thus far this season. If we correct for this we can adjust his SLG to somewhere between .485-.495, or another way to look at it is via his ISO which I’d forecast to be somewhere around .170-.185. Overall, if we’re projecting Cozart out over the rest of the season, I think it would be safe to bank on something in the range of .260/.340/.490, which isn’t a bad player and allows for some of his HR/FB% luck to stick in his projection. For those of you playing in OBP leagues, you can monitor the walk rate and perhaps you’ll get some new-found value there this year. With the growth we’ve seen in Cozart’s fly-ball rate, along with his corresponding doubles and home-run output over the past three years, he should safely set career highs in SLG and WAR. Stop me if you’ve heard this already. First base is a thin position right now. Sound familiar? I thought so. For that reason, many of us will be bargain shopping this draft and auction season, and one name that comes up as a down-the-board option is Greg Bird. Personally, I’ve had two major issues with ranking and projecting Greg Bird. The first is that he didn’t log any meaningful time last year due to injury. The second is in his 46-game, small-sample-size debut for the Yankees in 2015, he hit what I believed to be an exaggerated number of fly balls (51%). Further confounding the issue is that the percentage of those that turned into home runs (20.4%) seemed high compared to his output in the minors. In my quest for a more perfect valuation of Greg Bird, I decided to grab all the game logs from Trenton and Scranton/Wilkes-Barre from 2015 and create my own larger sample size data set for his batted-ball outcomes. In the table below, I’ve listed his batted-ball outcomes from his minor-league games in 2015. The following are his batted-ball outcomes for 2015 at all levels including his call-up with the Yankees later that summer. The fly-ball rate (47.9%) is accompanied by a 16% infield fly ball proportion that was markedly better in his short stint with the Yankees (11%) than in his larger sample in the minors (18%). Through the solely statistical lens, I’d say he squared up a greater percentage of his small sample size fly balls with the Yankees. I did manage to confirm for myself that Bird does come with a very fly-ball-heavy batted-ball profile. A large part of the reason fantasy league owners are excited about Bird is the park he plays in and the side of the plate he hits from. Yankee Stadium is a bomb-dropping paradise for lefties, and some of the success Bird had in his limited trial should be attributed to the more hitter-friendly parks he played in, versus what he saw in Trenton and Scranton/Wilkes-Barre. Courtesy of rotogrinders.com we can see Yankee Stadium plays with a 1.53 park factor for home runs in right field. Though I couldn’t locate hand-specific park factors for Trenton and Scranton/Wilkes-Barre, both play at around 0.75 for homers, which are very pitching-friendly. Playing half his games in these two parks certainly could have been the limiting factor for Bird’s somewhat lackluster 9.2% HR/FB mark in the minor leagues in 2015. While it’s fair to say we don’t know Bird’s true-talent level on HR/FB just from his statistics, I did perform some very simple math and calculate the difference in the two sets of park factors on home runs (~1.5 / ~0.75 = ~2x). It’s plausible that Yankee Stadium could offer a 2x boost on his HR/FB. While Bird might not be at a true-talent level of converting 20% of his flies into homers, he might be in the 18% neighborhood. Armed with this larger set of data, I began looking for comps for Bird’s fly-ball and HR/FB rates. My goal was to pull players from either the 2015 or 2016 seasons that had fly-ball rates over 45% and a home run to fly ball ratio at or above 18%. This does turn up an interesting list of sluggers with a wide variety of outcomes. If I relax the requirements a little further, you’ll start to get into the Joc Pederson, Lucas Duda, Luis Valbuena and Colby Rasmus group. Obviously this is a mixed bag of player outcomes because we haven’t tackled their BB% or K%, which impact the HR/SLG/TB categories in roto leagues or the bottom line in points leagues. Pederson, Duda, Rasmus, Carter, Sano, Moss and Napoli all have a much higher K% than Bird has shown in Double-A and Triple-A. In total, across all his MILB at-bats in 2015, Bird struck out only 17.5% of the time. Though you might speculate the pitcher-friendly confines of his home parks would dictate letting him put the ball in play was a more favorable outcome. In his limited stint with the Yankees in 2015, he posted a K% right around that 30% neighborhood, which brings him back to my favorite comp for his current skills — Mike Napoli. Bird also has other issues to contend with for fantasy baseball value which include: lineup slot, platooning, and, most recently — Chris Carter. For the sake of imagining the range of outcomes for Bird, let’s assume he got full time at-bats in the sixth slot in the Yankees lineup. We know that the sixth spot in the AL lineups averages around 675 plate appearances. If we use an 11% walk rate for Bird, that will leave him with ~600 at-bats to do HR/SLG/TB damage. My guess is Bird isn’t good enough to avoid a platoon, so for the sake of a range of predictions on his output I’m going to use the FanGraphs fans-predicted number of plate appearances (553) to give what I feel is a best-case set of scenarios for Bird’s home-run totals. Bird may already be the left-handed version of Chris Carter. I’m even more bullish on Greg Bird than I was before I started the investigation, and easily the high man on his HR output when considering Steamer, Fans, ZIPS and Depth Charts. His batting average will ultimately depend on where he settles in on his K% and his ability to blast liners and grounders through for hits. I think he’ll be an interesting Statcast case to monitor early this year. Inspiration struck me after reading Jeff Sullivan’s piece yesterday on how Christian Yelich could morph into Joey Votto with continued changes, or shall we say improvements, to his batted-ball profile. Namely, hitting the ball in the air more. As Jeff rightly pointed out, Yelich hammers the ball as well as anyone in baseball; it’s just that, to date, he’s done so much more often on the ground. You know who doesn’t have Christian Yelich’s problem? Nick Castellanos. Castellanos has driven changes in his batted-ball profile, which were covered last May by Eno Sarris when he documented the change in Castellanos’ launch angles. Why should you care? Because he’s slowly morphing into Nolan Arenado, and now is the time to buy. There have been only 10 players with at least 250PA each season since 2013 to grow their FB% year over year. Minimum 250 PA in each season 2013-2016. To be fair to Arenado, hitting more fly balls isn’t the only thing that’s made him the home-run king of the NL (now that Chris Carter has departed to the AL). It’s been his meteoric rise in HR/FB rate as well. There are 10 other players that would fit nicely on this table with Castellanos, but I’ll leave that as an exercise for the reader. Chances are, you’re already well aware of the other players that would join him on the list — I’m looking at you, Justin Turner. Much like the Yelich-to-Votto comparison, there are some things that keep Castellanos from becoming Nolan Arenado — namely his strikeout rate, which is 24.6% to Arenado’s 14.6%. This limits the number of balls he puts in play and thus the number of fly balls and homers he can hammer. However, with a little bit of health, growth and maturation in approach, we could see a 30HR season out of Castellanos this year.